At our special events we often run guided tours where you will be taken around the Castle in style! Guides will take you around the Castle, pointing out all that has taken place during the last 900 years and answering your questions, from bloody battles and sieges, ghostly goings on, the unique history of each room to tales of how families lived through the ages. 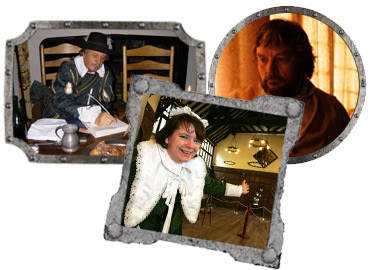 Each of Tamworth Castle's 15 rooms has its own unique tale to tell - and what better way to unlock its secrets than have a knowledgeable costumed guide take you through our history. Take a look at our events to see when we have guided tours taking place or get in touch with us directly! We also run guided tours for private groups of more than 20 people and we have an award-winning education programme to cater for children of all ages.